In the 7th and final post in my SDDC Series, we’ll take a look at one of the cooler integration stories between vRealize Automation (vCAC) and vRealize Operations (vCOps). This story is much like teaching your cloud to go on a diet; it’s all about eliminating waste in a cloud-like environment when possible, because not everyone is playing by the cool kids rules and able to charge their business units for consumption. But they should be! Not everything in your cloud reacts well to bullets. The same applies to ballistic nuclear submarines. And a long list of other things. In fact, very few things react well to bullets. But the line works well for my Hunt for Red October meme, so I used it. Part of the fun times blogger train that I rode during beta was watching vRealize Operations and Automation feeding information to one another. 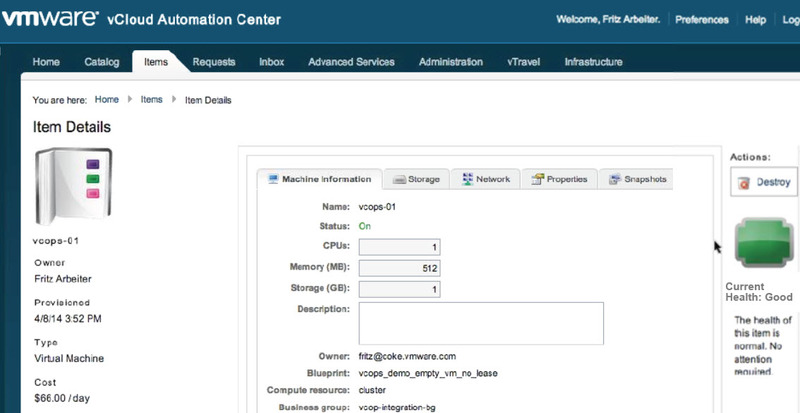 As shown below, see how I can now view health data of a workload from within vRealize Automation (shown as vCAC in the screen grab)? It’s on the far right side. That’s pretty neat – more value add to your IaaS consumers to get a picture as to the health of their workload without having to stare at the seamy underbelly of your cloud infrastructure. But the data can flow in both directions. vRealize Operations can run idle resource scans to identify candidates to be shut down. This is incredibly critical – lifecycle management is so often the missing piece of the SDDC puzzle. As it becomes easier and easier to spin up workloads, it must also become much more obvious and simple to remove those same workloads later. Determining which workloads qualify as idle can be tricky, but do-able. The settings below feed into this decision, and can be toggled between an On or Off state. Values such as the minimum acceptable network IO, CPU usage, and datastore IO can all feed into the VM being flagged based on an overall percentage of idleness. The same goes for oversized, powered off (frequently), and unused disk space. By running a reclamation savings report, the organization can view exactly which groups are able to save resources – and dollars – by giving back their requests and furthering the ultimate SDDC lifecycle. Lifecycle management is a personal pet peeve of mine, having been the arbitrator of several thousand VM discussions over the past years. And since most businesses have been unsuccessful at tying real dollar accountability on their consumers – hedging their bets with a showback or shameback model instead – this seems like a good next step to embrace. It will be nice when IT becomes a true private broker of resources and is able to relate the consumption of resources directly to a billing cycle, but that appears to be further off than we all hoped.